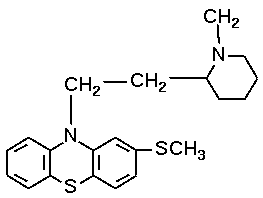 Thioridazine is a typical low-potency neuroleptic that is slighly less potent than chlorpromazine. It has a halflife of 7 to 13 hours. (Other sources have 16 to 24 hours.) It has the advantage of a low incidence of early and late extrapyramidal side-effects (tardive dyskinesia). In this regard it is very similar to the atypical neuroleptic clozapine (ClozarilÂ®). Thioridazine has also intrinsic mild to moderate antidepressive properties. It has antiemetic properties. Sedation is said to be less pronounced compared with chlorpromazine. Previous additional indications were agitated depression, tension and anxiety linked to alcohol withdrawal and dysphoria of epileptic patients. It had even (MellerettenÂ® in Europe) an indication for the treatment of psychosis in children and adolescents (10mg to 60mg daily). Thioridazine is known to kill multidrug-resistant mycobacterium tuberculosis and MRSA at clinical concentrations.. Autonomous side-effects (dry mouth, urination-difficulties, obstipation, induction of glaucoma, postural hypotension, and sinus tachycardia) occur obviously less often than with most other mildly potent antisychotics. Thioridazine is no longer recommended as first-line treatment due its side-effect of prolonging the QT interval on the EKG. Thioridazine-5-sulfoxide is responsible for the (ventricular tachycardia, torsades de pointes) according to Heath, Svensson and Martensson.